For those of you that don’t know me, I am extremely picky when it comes to, well, anything…so it should come as no shock that I have been looking for the perfect casual boot for the past few years, sadly to no avail. There are so many options to choose from and nothing had caught my eye, until now. 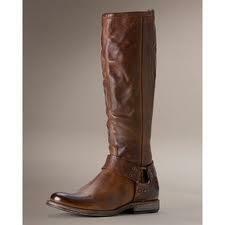 Recently, I had narrowed my list of choices down to riding boots. Having grown up with an interest in horses and getting the opportunity to ride them for two summers, I had always liked the simple yet timeless look of the riding boot. The sleek, smooth lines uninterrupted by much detail exude class. I have finally found the perfect one! The Frye Phillip Harness Tall. It is my dream boot. From the soft vintage leather to the barely there heel, it screams to be worn. Now, I am definitely a bit girly when it comes to how I present myself and although these Frye boots possess a certain ruggedness, I feel that they will be a good addition to my style rather than emasculating it. I love the cognac and dark brown, and honestly would have a hard time choosing between the two. They also come in black. At $328 before tax, they’re a bit steep, but Frye boots aren’t just any boots; they’re an investment. Not sure if I will in fact purchase these, but I will dream about them until I do!